PlasterTex™ is a texture material specially formulated to create a grained plaster finish and can be tinted with FauxCreme Color™. It can be used as a base coat for a Venetian Gem® finish or as a final coat when a rough, distressed look is preferred. PlasterTex™ may be applied over most ordinary dry acrylic latex paints, but it is always suggested to check the bond in a small area before beginning or completing an entire work project with any paint or plaster material. SofTex™ is a smooth textured plaster product used to create a variety of soft appearance and the feel of fabric-like finishes. This unique material has excellent bonding characteristics over old paint and will even smooth out nail holes, rough corners, and minor cracking on old walls. 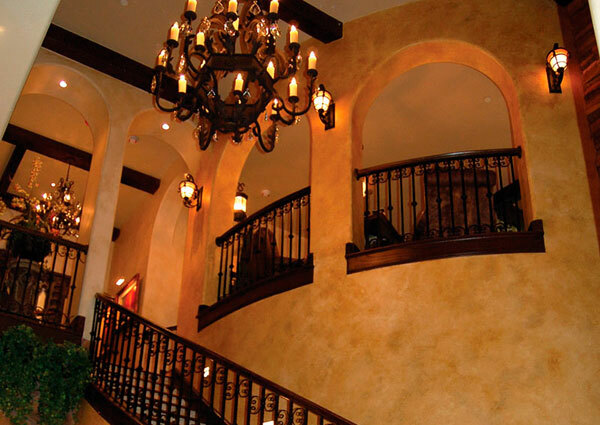 StucoLux™ Fine Polishing is a decorative, easy polishing mineral-based Venetian plaster. A creamy, smooth material, it glides on easily across most substrates. StucoLux™ has very good interior and exterior durability and provides beautiful undulations of color depth in the final finish. StucoLux™, a light weight, buttery smooth, fast-drying, high sheen, mineral-based Venetian plaster. This material is easy to apply by trowel and glides across virtually any substrate. When burnished it provides a dramatic high gloss effects! Available in a full variety of colors including metallic colors. Sold in quarts, gallons, and 5 gallon buckets. Palette Deco™ is a water-based, durable, paste-like material that can be applied by roller, brush or even by a sprayer with the proper equipment. It also can be applied by trowel, spatula or palette knife. Palette Deco™ is very durable and in most cases does not require a protective topcoat. Create dramatic stripes using Palette Deco™ or use it through a stencil for an embossed look. Palette Deco is also used as a base for future color work. O’Villa® Finishing Plaster is a versitile plaster finishing material with a variety of uses. Produces Old World plaster walls, also used for furniture finishes, metal work coatings, etc. May be brushed or troweled.